In order to truly connect with others, we need to show up. 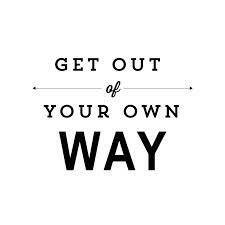 Get out of our own way. Stop listening to the little gremlins inside our head that tells us we’re not good enough. All types of relationships are based on connection and whether we see and feel that connection or if we don’t. To feel is to be vulnerable, putting ourselves out there. It’s about self-acceptance and knowing we are not perfect and that it’s the imperfections we carry that make us beautiful. When someone reaches out to another person, they are being vulnerable, courageous and aware of their imperfections. What they are looking for is empathy which is very different from sympathy. Empathy makes us feel like we are not alone and that somebody cares and understands us. We feel connected. Sympathy only drains us and makes us feel even more alone – disconnected. Sometimes it’s not the response that makes things better but it’s the connection. This short and cute 2:53 minute video explains it very well. If we want deep, authentic connections we need to get out of our own way, start being vulnerable by feeling every emotion and forget about perfection. Worthiness doesn’t have prerequisites but many of us have a long list that we have created or have been handed down to us. I would like you to play along and ask yourself the following questions and answer them as honestly as possible, just for your own knowledge. Have you ever felt like you didn’t belong somewhere? Or had the thoughts that you weren’t good enough? Were you able to feel that you were worthy and deserving of love and belonging? How do you feel about love and belonging right now? If you could give yourself some advice right now on how to deal with worthiness and love and belonging, what would you say to yourself right now? Imagine you are talking to a child about worthiness, love and belonging, what would you say to that child? Are you able to accept this advice you just gave to a child and use it for yourself? You are enough so no need to hustle. You’re actually more than enough. 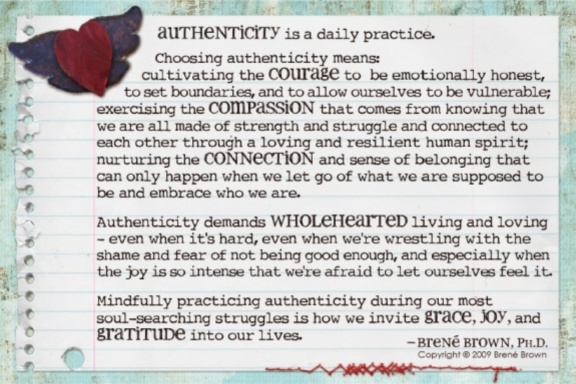 I am slightly obsessed with Brené Brown and if you have never heard of her before, allow me introduce you to her. She has a Ph.D. in Social Work and has been studying shame, courage and vulnerability for over fifteen years now. She has appeared on TED Talks, Oprah and has written inspiring books such as The Gifts of Imperfection: Let Go of Who You Think You’re Supposed to Be and Embrace Who You Are and Daring Greatly: How the Courage to Be Vulnerable Transforms the Way We Live, Love, Parent and Lead. One of my favorite chapters she writes about is on fitting in vs. belonging. They are not the same thing and one gets in the way of the other. They are two sides of the same coin. Fitting in is about assessing a situation and becoming who you need to be to be accepted. It’s the disease to please. It’s chasing down some acceptance and worthiness so we can feel better about ourselves. “I will feel worthy when…” or “I’ll be whoever or whatever you need me to be, as long as I feel like I’m a part of this.” It’s an uncomfortable feeling. Remember high school? Belonging, on the other hand, doesn’t require us to change who we are; it requires us to be who we are. True belonging only happens when we present our authentic selves, imperfections and all. It’s about self-love and self-acceptance and embracing who we are. Essentially, it’s the act of courage and unconditional love for ourselves. You know when you belong somewhere or with someone because you can feel it in your body. You feel loved at peace and free. 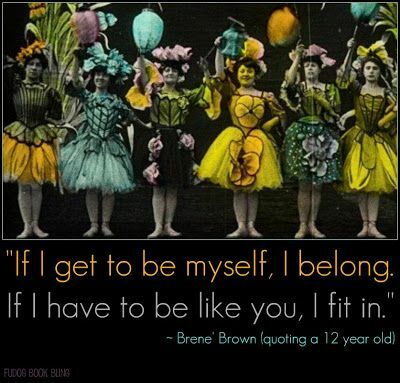 Therefore, fitting in gets in the way of belonging. It’s the gremlins that set up camp in our heads that tell us “you’re not good enough.” It’s hard to feel worthy of love and belonging when you listen to this little monster. The truth is, love and belonging means uncertainty but they still go together. And according to Brené, those who have a strong sense of love and belonging, have the courage to be imperfect. I found this concept really interesting because many people believe that fitting in and belonging are the same thing when in fact they’re not. My question to you is this; are you living your life according to fitting in or belonging? The next question is why? Sometimes you just have to say “enough already” and let yourself off the hook. If you are not familiar with Brene Brown’s work, allow me to introduce you to one of my favorite speaker’s on earth. She is a researcher, a storyteller and a Texan according to her Twitter account. When we live with vulnerability, we live with our whole hearts which creates a beautiful feeling of happiness. This 20 minute TED talk is so inspiring I highly recommend you take the time to watch it because in the end, we are all enough.